We are heading to the way-beyonds of south Cork tomorrow, taking a few days away to relax, sleep, eat and enjoy the outdoors. Before we go I thought I would leave you with some sweet easter treats. These cupcakes were my first time adding malt powder to buttercream. Oh my. This is genius! So delicious I may or may not have eaten several spoonfuls straight from the bowl. It was also my first time making filled cupcakes. These babies have a secret strawberry jam centre. Filling cupcakes is way easier than I imagined. My secret weapon was an apple corer. Press down gently while twisting the corer and a neat little round of cupcake comes away easily. You can even pop out the ‘core’ and put the top back on after you’ve filled them. I’m now dreaming up all the wacky things I could fill a cupcake with… any suggestions? There is not a recipe as such, just a suggested cupcake combo. These are vanilla cupcakes with strawberry jam filling and strawberry malt buttercream. Do it! You can use whichever is your favourite go-to cupcake recipe for these and fill each one with a generous teaspoon of homemade or store-bought preserves. 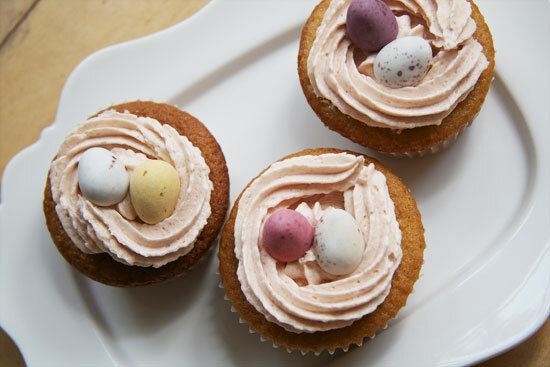 Swirl generously with this (honestly A-Mazing) buttercream and decorate with mini eggs. Voila, sweet easter treats! Have a happy Easter my friends. Beat the butter until smooth and gradually mix in the malt powder and half the sugar. Add the jam and stir. Gradually add more icing sugar until your buttercream reaches the desired consistency. Add more or less icing sugar as needed.